A Vietnamese tourism delegation visited Toronto Monday night, promoting the attributes of the southeast Asian country, which includes a food scene that drew international attention when late food enthusiast Anthony Bourdain and former U.S. president Barack Obama had lunch together in a modest but popular Hanoi restaurant that serves the likes of pho, a hugely popular dish in Vietnamese cuisine. In fact, CNN has declared Hanoi one of the top 50 food centres. Rajat Chhabra, general manager of the Radisson Suites Hotel Toronto Airport, who earlier worked as a hotelier in Vietnam, praised “beautiful” Vietnam’s hotel infrastructure, saying five-star hotels with excellent service are available. Van Nguyen, chairman of the Vietnam National Administration of Tourism, said tourism to his homeland is soaring. Vietnam saw a million visitors in 19900. Last year, over 13 million visited the country. 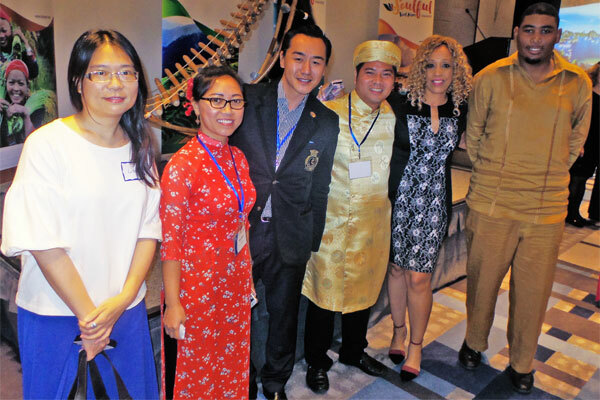 Seen here are tourism consultant Lisa Lau; Hang Nguyen of Silkstar Holidays: Le; Luong Van Nguyen of Gia Linh Travel & DMC; and Jackie Bishop Martin of Journey the Globe and Anton Martin.